Spring is the perfect season for refreshing your collection. Here are the major auction sales and art fairs in March, April, May and June where you’ll be sure to find your next statement piece. Hong Kong has quickly become the third largest art market in the world, and the main reason for its rise comes down to this fair started 10 years ago, when it was known as Art HK. Like the Miami Beach and Basel, Switzerland, editions of the fair, Art Basel Hong Kong (ABHK) is a behemoth, this year boasting nearly 250 galleries from 32 countries, including over 20 New York galleries, with Manhattan mainstays like JTT, Petzel, and Gavin Brown’s Enterprise joining in on the fun for the first time. There are also two dozen local galleries on the line-up this year, marking the continued solidification of Hong Kong’s hometown art scene. If you haven’t burned through your pocketbook at ABHK, head to back-to-back evening sales at Sotheby’s offering a selection of modern to contemporary works by both Asian and Western artists like post-war master Hsio Chin and key figures from Japan’s radical midcentury Gutai movement. Of special note is Nu Endormi, an intimate portrait made by Sanyu—once hailed as the “Chinese Matisse”—of his French muse, making its way to auction for the first time in 50 years and estimated to bring in $2.5 to $3.5 million. The Dallas Art Fair has grown by leaps and bounds since it was started 10 years ago and it seems to have galleries clamoring to partake this year—a third of its nearly 100 participants are newcomers, including New York’s James Cohan, Van Doren Waxter, and Rachel Uffner. That’s good news for returning collectors who want some fresh offerings, although the high turnover and curious non-return of both international heavyweight Gagosian after just one go at the fair last year and longstanding local favorite Ro2 suggests this might be a bellwether year for the fair’s success over the next decade. One of the most significant fairs in Latin America, SP-Arte’s 14th edition boasts nearly 200 international exhibitors. Given Brazil’s unique and unparalleled history of modernist design thanks to the likes of Lina Bo Bardi and Oscar Niemeyer, the fair’s featured furniture and antique pieces are a must see in the still relatively new Design Sector, which will present a new space dedicated to independent designers and emerging talents this year. It’s worth noting that while Brazil is beset with prohibitive export taxes, SP-Arte maintains an agreement with the estate of São Paulo for tax exemption during the fair, making it one of the best market opportunities for international collectors. Phillips has carved out a niche for itself as the first auction house stop for contemporary artists whose careers are on the rise and its “New Now” sale is where the asking price for many is first set. Though last fall’s New York sale was overshadowed by artist Mark Grotjahn’s social media shout out that Phillips’s lot attributed to him with an asking price of $20-30,000 wasn’t actually his work—prompting the auction house to drop it from its offerings—its London New Now sales in December were its strongest to date. On top of the recent spring New York sale that realized a decent 86 percent sell-through rate by lot, Phillips’ first evening sale of the year is looking promising. Continuing a Gold Rush-like trend in the art world to tap Northern California’s riches by making art lovers out of tech millionaires, the If So, What? fair will launch its inaugural edition this spring. Although it follows in the steps of other art fairs keen on establishing themselves in the Bay Area over the past couple of years such as Fog Design + Art and Untitled, this event—started by Sho-Joung Kim-Wechsler, the former head of finance for the New York-based art start-up Artsy, and Linda Helen Gieseke—bills itself as unique, blending art, design, technology, and sound, which may be the perfect combo for techies looking to get their art on. London’s most important art fair is only increasing in influence, recently announcing it will take over Los Angeles in early 2019. It’s spring New York edition, launched in 2017 on Randall’s Island, has already become one of the biggest annual art affairs on the East coast, much like prom before school lets out for the summer. This year will be no exception, especially since the fair boasts a new artistic director, Loring Randolph, a new and hopefully improved layout, and an extra day of VIP previews. This is the headliner auction of the season, no ifs ands or buts about it. Art aficionados have been frothing at the mouth as early as last November over this stand-alone spring sale, when the collection of Peggy and David Rockefeller went on view at Christie’s Hong Kong outpost. Since then, the exhibition has been traveling, first to London then Los Angeles, with additional objects revealed in each new city, upping the media frenzy and collector bidding ante with each stop. When it settles in New York in May, where it will be auctioned off just a touch ironically at Christie’s Rockefeller Center, Picasso’s Fillette a` la corbeille fleurie—a rose period work with outstanding provenance, having once been owned by Gertrude Stein—is expected to reel in upwards of $70 million. Lisbon is being touted as the new Berlin, with a growing art market and still-cheap rents that keeps artists living and working in the city, at least for now. When ARCO Lisbon—a spin off of Spain’s successful ARCO Madrid fair—launched in 2016, many were skeptical about the fair’s viability, but the city’s rapidly expanding art scene made for a bigger and better second edition last year. And with rumors that an increasing number of French, Swiss, and Belgian collectors are buying summer homes in the area, it seems like this year’s edition will strive to bring even more heat. If Frieze New York is prom, then Art Basel in Basel is the art world’s Rhineland summer camp. 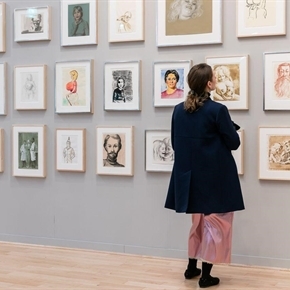 One of the OGs of art fairs, Basel draws in the cream of the crop of the world’s art galleries, all of whom are usually bringing their freshest offerings to market. This year, as per usual, the fair has nearly 300 participants on its roster, including notable newbies Essex Street of New York, London’s Carlos/Ishikawa, and Freedman Fitzpatrick of Paris and Los Angeles.